Abstract: Objective To study the effect of human CCR4-NOT transcription complex subunit 7 (CNOT7) gene knockdown on the immune microenvironment of HepG2 cells and explore its significance. Methods We designed a cell transfection protocol and performed the experiment with three groups:CNOT7-targeted knockdown group, control group, and CNOT7 overexpression group. The transfection efficiency was assessed using inverted fluorescence microscopy, and the expression level of CNOT7, transforming growth factor-β1 (TGF-β1), and nuclear factor-kappa B (NF-κB) p65 proteins was determined by western blotting. 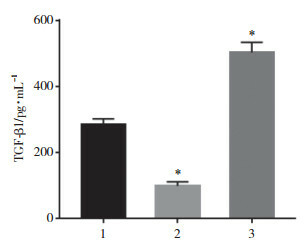 The concentration of TGF-β1 secreted in the cell culture supernatant was measured by ELISA. The sensitivity of tumor cells to the killing function of natural killer (NK) cells was detected by flow cytometry. Results Compared with the control group, the expression level of TGF-β1 and NF-κB p65 proteins was significantly decreased in the CNOT7-targeted knockdown group, and the TGF-β1 concentration in the culture supernatant was also significantly reduced. However, in the CNOT7 overexpression group, the expression level of the two proteins and TGF-β1 concentration were significantly increased. NK cells were co-cultured with tumor cells, and the apoptosis rate of HepG2 cells transfected with CNOT7-specific shRNA was significantly increased. However, in the CNOT7 overexpression group, the apoptosis rate was significantly decreased. Conclusion CNOT7 forms the immune microenvironment of hepatocellular carcinoma. Targeted knockdown of CNOT7 can reduce TGF-β1 secretion and enhance the killing function of NK cells toward HepG2 cells.